Half time: Arsenal 2-1 Everton: Up until Barkley's late first-half goal, it certainly looked like this was Arsenal's game for the taking. They've looked far more comfortable on the ball and have threatened the Everton back four, particularly down the right flank. Their two goals in quick succession looked to confirm their dominance but Barkley's deflected goal means the visitors are still in this game. Bring it on. And that's the whistle, we're underway for the second half! 46 min: Ozil, Sanchez and Cazorla link up nicely around the centre circle before the ball gets drilled across the turf into the box. Girould takes a dummy step over the ball and it continues into the feet of an incoming Sanchez. He takes a low-driven shot but Howard manages to get to it and pushes the ball past the right-hand post and out for a corner. 49 min: Nothing comes of the corner and we've currently taken a pause as Jagielka receives treatment for a knock. 50 min: Coleman finds himself with a bit of space 25 yards out. He shifts the ball to his right, takes the shot, but Cech faces no real issues with it and easily claims the ball. Jagielka comes off for Ramiro Funes Mori. 52 min: Another big chance for Arsenal! The Ox gathers the ball on the centre spot and drives 20 yards forward with Sanchez and Giroud to either side of him. Stones forces him to release and he plays a through ball to Sanchez but it's slightly too heavy and Howard manages to just get a hand in, knocking it out for a corner. Nothing comes from the corner but Arsenal are starting to apply the pressure again. 55 min: Giroud and Ox share the ball in the middle of the box, taking some clever touches in the process to bring the ball down, before the Arsenal striker manages to get a shot off but Howard easily stops it and it goes out for another corner. 58 min: Yet another huge chance from Arsenal! Bellerin plays a clever through ball down the right to the Ox. He drills the ball across the face of the goal to an outreached Giroud but he can't quite meet it and the ball leaves the other side of the box and the danger is cleared. 62 min: On the back of an Everton chance, Arsenal break with pace and once again threaten the Everton goal. A ball is floated in over the back four to an on-running Ozil but he can't quite get there and Howard instead comes to claim the delivery. 63 min: Ozil again! Giroud brings a high ball down with a softening header and it bounces into the path of Ozil who instinctively snaps at the ball with a half-volley. It swerves to the left but Howard manages to get his hands to and holds onto the shot. 66 min: Gareth Barry picks up his 107th yellow card for holding on to Cazorla in the centre circle. 68 min: Monreal momentarily turns off and gives the ball away to Barkley in his own third. Parallel with the goal line, the England midfielder carries the ball across the edge of the box before rolling it into the feet of Barry whose shot finds its way into the hands of Cech. Arsenal immediately break and Giroud comes close to scoring again as he launches a shot against the woodwork. 69 min: Lennon comes off for Kevin Mirallas. 71 min: Poor Everton fans. Their team is losing and it appears the late trains to Liverpool have been cancelled...Nobody wants to hear that. 73 min: A lovely ball is whipped into the Arsenal box and Galloway manages to get a head to it at the far back post but it's not quite enough. Goal kick. 78 min: Everton hit the crossbar! Under intense pressure from Arsenal on the edge of the box, Everton do incredibly well to recycle the ball before whipping in a cross which Lukaku meets. His header looks like it's going in but it clips the bar and heads out for a goal kick. So close! 80 min: Flamini replaces Oxlade-Chamberlain who's just emerged from an almighty battle with Galloway down in the right-hand side corner. Let's see what he can bring to the game! 82 min: Bellerin surges into the box from the right flank and, surrounded by at least three Everton defenders, it looks like he's been pushed but the ref waves it away. Flamini tries to scramble for the loose ball but he ends up knocking it out for a goal kick. 84 min: Arsenal are desperately looking to seal the game with a third goal and have set up camp in the Everton third. The ball is played from side to side across the Everton box before finding its way to Flamini. He takes his shot but it goes wide of the post. Seconds later Flamini again wastes another chance for Arsenal as he headers the ball straight into the hands of Howard on the back of an Ozil cross. 85 min: What a save by Cech! Deulofeu has taken a shot from inside the box but the Arsenal keeper reads it perfectly and gets down well to pull off the block. 88 min: Sanchez is replaced by Kieran Gibbs. 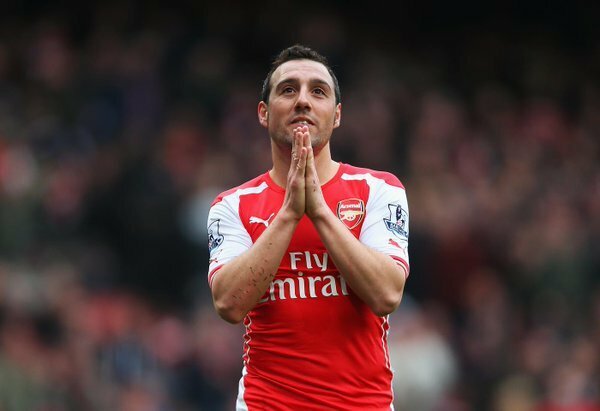 Hardly a rest for him after Wenger said he'd be looking to take it easy for the Chilean. 89 min: Arsenal hit the post again! From 25 yards out Ozil fires a shot at goal but it skims against the right-hand side post. 90+1 min: Mirallas foolishly gives away a free kick within Everton's own third but lucky for him nothing comes of it and the visitors are given another chance to claw one back. 90+3 min: What an exciting ending! Arsenal drive into the Everton box bringing Howard out of his in the process. As he scrambles for the ball, Ozil plays it back into the box but Giroud fails to bring it under control to take the shot and its cleared away. Moments later Barry is sent off in a dramatic finale before the ref blows the whistle. Full time! 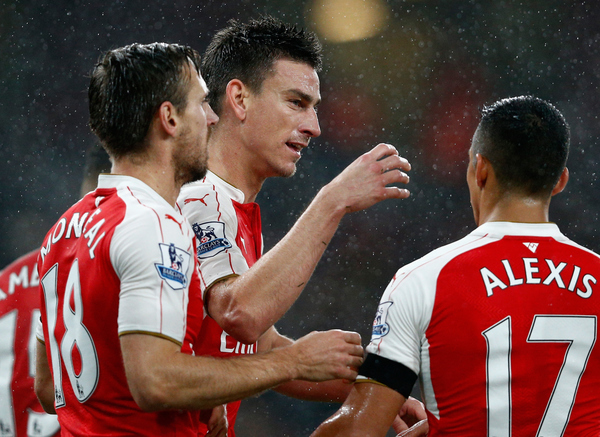 Arsenal 2-1 Everton: And that's the three points! In a lively game full of chances for both sides, Arsenal managed to cling onto their lead and now sit pretty at the top of the league with 22 points. 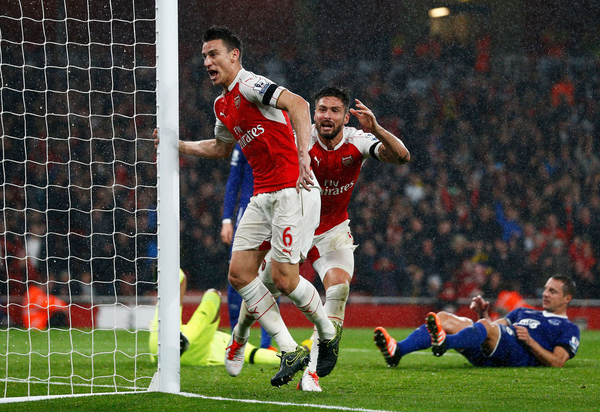 Giroud proved his worth throughout the 90 minutes providing the home side with a goal alongside a number of chance. Everton were never completely out of this match but lacked that clinical edge in the final third. Arsenal will be disappointed with certain elements of their game but there's no doubting they'll be smiling as their good form continues. It's been another entertaining day of football but that's it for now. Make sure to tune in for our coverage of tomorrow's games. That's all from me, over and out!